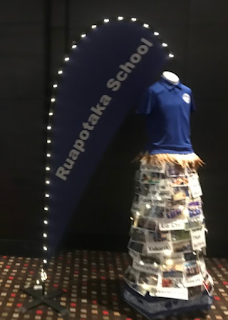 On the 8th of November all of Ruapotaka School went to the Manaiakalani film festival in Sylvia Park Hoyts. We went by a bus and we needed three buses to go in the Sylvia Park Hoyts. When we arrived we didn't have to walk a long way. Then we had to go and sit in a little space under the steirs for going into the Hoyts by the alavater. Then we saw some other schools walking down the steirs from Hoyts. Then it was time for us to go into Hoyts .When we got into Hoyts we went into cinema 2. We were inside the cinema with St. Pius and the presenters from all the schools in the Manaiakalani progrem. Then we had to find our sits I was in sit 26g next to my friend Faye. We watched 12 films made by all of the schools in the manaiakalani progrem. My favourite film that we watched was Tamki Colleges the Driving Lesons. When it was finished we all came back to school and went home.